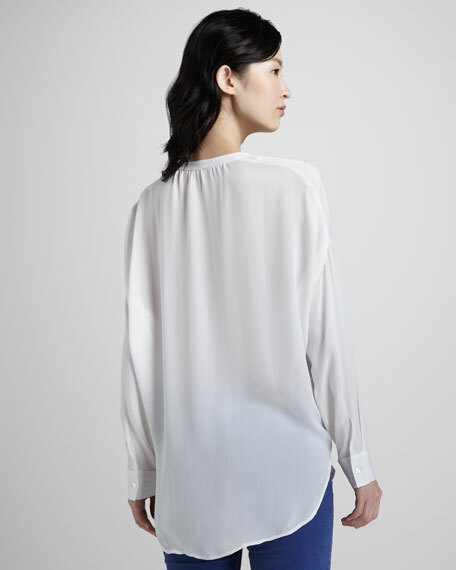 Slip on this smooth silk Vince top when you're heading out for lunch. Grab a sweater to layer over when the weather chills. Model's measurements: Height 5'11"/180cm, bust 33"/84cm, waist 24"/61cm, hips 34"/86cm. Founded in 2002, Vince is a leading luxury, contemporary brand known for modern, effortless style and its everyday fashion-forward essentials. Vince offers a broad range of women's and men's ready-to-wear, including its signature cashmere sweaters, leather jackets, luxe leggings, dresses, silk and woven tops, denim, and shoes.